Being amazed by Montana can be as simple as driving around. 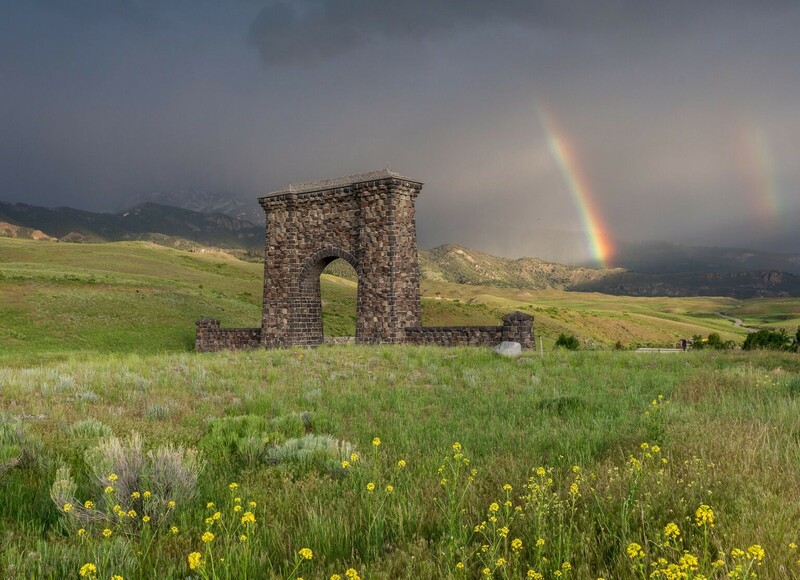 With a landscape that varies from jagged mountain peaks to rolling plains and rushing waterfalls, Western Montana is home to numerous scenic drives and byways with pull-over opportunities for recreating, like hiking, fishing and self-guided historical tours. *Winter note: many byways are not plowed during the winter months and are closed to vehicular traffic. Be sure to check road conditions and closures. During winter, many byways provide excellent routes for snowshoeing, cross-country skiing and snowmobiling. Climbing over glacial debris and through beautiful pine forests, this road offers beautiful views of Chief Mountain—a sacred site for the Blackfeet Tribe. Crossing the international border, you're afforded a view of Mount Cleveland, the highest peak in the Waterton-Glacier International Peace Park at 10,466 feet. Noteworthy: The road is closed from mid-September to mid-May. Glacier National Park's Going-to-the-Sun Road received its official name during its 1933 dedication at Logan Pass, borrowing its name from nearby Going-to-the-Sun Mountain. Taking 11 years to compete (from 1921 – 1932), this engineering marvel is also a National Historic Landmark. Taking visitors through the heart of the pass, you travel past the Garden Wall, cross the Continental Divide at Logan Pass at 6,646 feet before reaching St. Mary. Visitors can travel the road via their private car, aboard the parks' free shuttle system (early July - early September) or on an interpretive tour inside a historic red jammer with Xanterra or with Sun Tours. There are numerous scenic viewpoints and pullouts along the road, offering visitors plentiful photography opportunities. Hiking trails can also be accessed at various points along the road. Additional recreation opportunities on the Going-to-the-Sun Road include recreational bicycling, as well as snowshoeing and cross-country skiing during the winter months. Please be aware of Going-to-the-Sun Road's vehicle size limitations. Special consideration: While portions of the road remain open year-round, the entire Going-to-the-Sun Road is typically open all the way across from mid-June to mid-September, weather dependent. Located in the quiet corner of northwest Montana, this scenic byway follows the Kootenai River and Lake Koocanusa along Highway 37 between Libby and Eureka. Open year-round, this route takes travelers along the east side of the lake. The byway also includes a side route (Forest Development Road 228) along the west side of the lake that is closed during the winter. Special consideration: The area along the byway has numerous recreational opportunities like camping, fishing, boating and sightseeing. Incredible fishing can be found on the blue-ribbon Kootenai River—home to trophy-size rainbow trout. While traveling the byway, stop at the Libby Dam Visitor Center for a guided tour of the dam and to learn about the partnership between creating Lake Koocanusa. Looking Glass Road offers a beautiful scenic drive on the east side of Glacier National Park. This curvy road (Highway 49) is located on the Blackfeet Reservation and provides beautiful views looking into Two Medicine. You'll also have a good chance of seeing wildlife in valleys along the highway, including grizzly bears, moose, black bears and wolves. Be sure to respect wildlife and keep your distance. This scenic drive takes travelers through the Swan Valley to the Seeley Valley, between the Bob Marshall Wilderness and Mission Mountains. This beautiful, meandering drive passes hundreds of lakes, incredible hiking trails and provides a quiet peacefulness. Just be sure to keep your eyes open for the many deer and elk that live in the valley and cross the road often. Special consideration: Stop and explore this beautiful valley by visiting the Alpine Artisans' Tour of the Arts, hiking to Holland Falls or taking a trail into the Bob Marshall Wilderness. Located three miles south of Hamilton, this primitive seasonal road (Highway 38) links the communities of Hamilton and Philipsburg, taking travelers along a beautiful route into the Sapphire Mountains. Once heavily used by American Indians, this route was turned into a road in 1924, forming a link between the mountain mining areas with the agriculturally rich Bitterroot Valley. This narrow drive provides incredible views and takes its travelers past Skalkaho Falls. Stay on the lookout for large herds of elk during early morning and late evening, as well as moose and black bears. *Trailers are not recommended, as there are narrow curves with limited pullouts. Special consideration: The highway is typically open from June to September, weather dependent. The road is not plowed all the way across during the winter months, making it an ideal snowmobile destination. An alternate route for travelers on Interstate 90, this scenic byway provides motorists with another route to Glacier National Park and Flathead Lake as you travel past varying terrain including rolling flats and steep canyon walls. Special consideration: Slow down and enjoy the seamless blend of wilderness and civilization in this corner of Montana. Cast a line in the Clark Fork River or fill up with a hearty breakfast at a local diner before continuing on your journey. Highway 2 is a two-lane highway that winds along the southern border of Glacier National Park and connects the 56 miles between East Glacier and West Glacier, taking travelers inside the park's boundary for a portion of its route. Special consideration: Located just off Highway 2 is the Goat Lick, an exposed riverbank where mountain goats and other animals come to lick the mineral-rich cliffs. A short paved path leads to an observation stand overlooking the waters of the Middle Fork of the Flathead River. April - August are the best months to view goats at the lick. This route takes travelers through the heart of the Yaak Valley in northwest Montana, an area filled with wildlife surrounded by nature at its finest. The road takes you past the Yaak River and Yaak Falls.